This guide describes the licensing model used for distribution of commercial products based on UniMRCP server. The license file needs to reside on the same host as the product. A license file is made for a certain number of concurrent MRCP channels. Typically, there is one-to-one correlation between calls on the IVR platform and channels on the MRCP server. In other words, in order to support N concurrent calls, an N-channel license is typically required. Various license types are available. A free 2-channel 30-day trial license is provided upon request. The trial licenses are primarily made for evaluation purposes and can also be used in presentations and proof of concept projects. Trial licenses are not provided recurrently. An N-channel production license can be purchased by making a one-time payment. The licenses can be owned perpetually or used on an annual basis as a service. 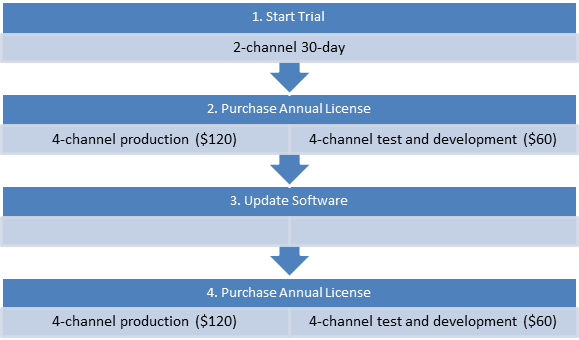 A customer, having purchased an N-channel production license, is entitled to purchase an M-channel test and development license, where M <= N. The test and development licenses are made to replicate production environments and cost 50% of the nominal price. Licenses can be either owned perpetually or used on an annual basis as a service. A license file is made for a particular version of a product and owned perpetually. The license allows free upgrades to newer versions of the product produced during the first year after the license issuance date. Afterwards, the license can optionally be upgraded at 25% of the nominal price. A license file is made for a period of one year. The license allows free upgrades to newer versions of the product. Upon expiration of the validity date, a new license can be purchased. In an architecture, where each node is deployed in a redundant pair, a license for the primary node can be purchased at the nominal price, and a license for the secondary node at 50% of the nominal price. Licenses for the primary and secondary nodes shall be placed in the purchase same order. 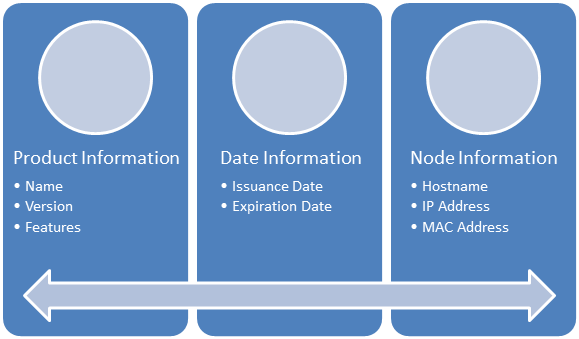 The primary and secondary nodes are NOT entitled to be used in a load balancing mode. In order to generate a license file, the corresponding node information must be obtained and provided by the client. Installation guides of each product contain detailed instructions on how to obtain uninode.info file. A license file is bound to a node the license is generated for and shall be deployed to and reside on the corresponding node at all times. Node-bound licenses are NOT transferable to other nodes. The use of the license server allows for flexible distribution of licenses without any bindings to particular nodes. Refer to the License Server Usage guide for more information. Use-cases provided in this section help understand the licensing model. The use-cases are provided as a reference only. This use-case is made for a product priced at $50 per channel for a perpetual license. 1. A client requests a 2-channel 30-day trial license for evaluation. 2. Upon a successful completion of evaluation, the client decides to purchase a 4-channel permanent production license, by making a payment of $200 = 4 * $50. The client also prefers to replicate the production environment and purchases a 4-channel test and development license, by making a payment of $100 = 4 * ($50 / 2). The two licenses can be placed in the same order. 3. A new version of the product is released within one year after the license issuance date. The purchased production and test/development licenses allow to upgrade to the new version of the product at no additional cost. 4. A new version of the product is released after expiration of the graceful upgrade period. The client requests an upgrade of the purchased licenses by making a payment of $50 = 4 * ($50 / 4) for the production license and $25 = 4 * (50 / 8) for the test and development license. This use-case is made for a product priced at $30 per channel for an annual license. 2. Upon a successful completion of evaluation, the client decides to purchase a 4-channel annual production license, by making a payment of $120 = 4 * $30. The client also prefers to replicate the production environment and purchases a 4-channel test and development license, by making a payment of $60 = 4 * ($30 / 2). The two licenses can be placed in the same order. 4. Upon expiration of the validity date, the client purchases new annual licenses.